Who is this promotion type for? This promotion type is a good fit if you want to provide what shipping plan to offer for free to some of your customers. If your store is configured to offer multiple shipping plans, you likely want to offer free shipping only for a subset of those plans. In the "offer" step, optionally configure an amount that customers need to spend for the promotion to activate. Switch the Type to discount to disable to minimum spend option. 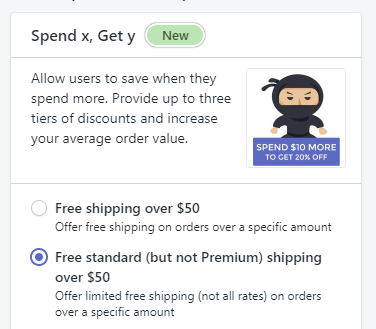 In the advanced section of the "offer" step set the "Exclude shipping rates over a certain amount". Finish setting up your promotion. Double check and customize the text in the Notification, Sticky bar. Edit the promotion and customize the label in the "Cart & checkout text" tab. This promotion is configured to offer free "Two-Day Shipping" to customers who spend more than $50. The promotion is private, i.e. it is accessible only via the above link.